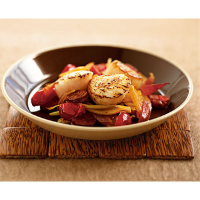 Delicately flavoured scallops are partnered with a warm winter tomato salsa, made with spicy chorizo and crunchy fennel. Make the salsa: warm a large non-stick frying pan over a high heat and add the chorizo slices. Fry for 2 minutes, or until the oil is released. Add the onion and cook for a further 2-3 minutes. Stir in the tomatoes, fennel and wine and cook for another 4-5 minutes or until the wine has evaporated. Season with freshly ground black pepper. Spoon the salsa into a serving dish and keep hot. Wipe the frying pan clean with a piece of kitchen paper. Pat the scallops dry with more kitchen paper. Return the pan to the heat. When hot, add the scallops and cook for about 1 minute on each side, or until just golden. Serve immediately with the hot salsa and wedges of Waitrose Spanish Style Seeded Pan Gallego bread. Make the salsa up to the day before and simply reheat when needed. This recipe can be used for larger numbers. Increase the salsa ingredients as necessary and cook the scallops in batches so the pan stays really hot as they cook. This recipe was first published in November 2004.